Amanda Seyfried as Red Riding Hood takes an ill-advised stroll in the woods. Red Riding Hood is exactly what it should be: a grownup retelling of one of our most memorable fairytales, with a horror spin. It has interpersonal conflict, a complex storyline, romance — but it also stays true to the elements that made the tale so compelling to us as children. There is the underlying theme of sexual awakening, the symbolism of the red cape, the opposition of good and evil. Even the talking wolf, the walk through the woods to grandmother’s house and the line, “What big eyes you have,” are worked in. The high production values — sumptuous period costumes and sets — completely immerse us in a medieval world, and yet the swooping, swerving camera lends the film modern-day immediacy — as well as a perpetual feeling of unease. In its creation of an olden-days town surrounded by menace, the atmospheric film is reminiscent of M. Night Shyamalan’s “The Village.” But here, the story is NOT torpedoed by awful plot turns. 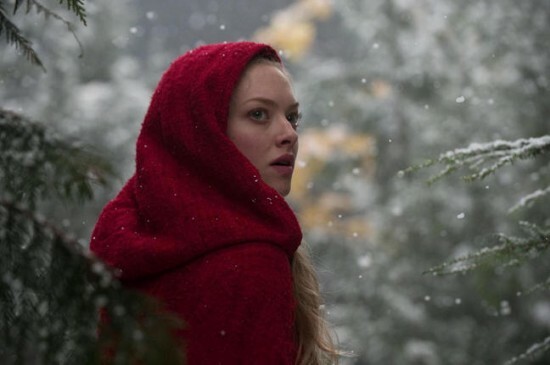 Red Riding Hood is Valerie (Amanda Seyfried), a pretty young woman in love with a poor woodcutter. Her parents disapprove of him and the lovebirds are about to run off together when the body of her sister is discovered, killed by a werewolf. The village men vow to track down the beast and they quickly do — they think. Then arrives Reverend Solomon, a werewolf-hunter extraordinaire who is a mixture of Cotton Mather and Robert E. Howard’s witch-hunting Puritan man of action, Solomon Kane. Rev. Solomon (Gary Oldman) warns the townsfolk that the creature they’ve just killed is an ordinary wolf, and that the real werewolf does not dwell in a mountain cave, as they believe — but is instead one of them. A paranoiac “Who Goes There?” type nightmare ensues, as Valerie struggles to figure out which of those around her is the murderous monster — while avoiding a horrible fate as its prime target. Is the Big Bad Wolf her dark, brooding, black-clad boyfriend? The strangely feral village idiot? The handsome young blacksmith who seems so gentle and fearful? Or even her own extremely creepy grandmother (played with magnificently, and gleefully, by Julie Christie)? To make matters worse, the town’s “savior” Rev. Solomon emerges as an Ahab-like lunatic who doesn’t care who he has to imprison, torture, put to the sword or use as human bait to take down the lycanthrope. The mystery angle in this kind of story is always hard to pull off. After all, the screenwriter has to come up with a solution today’s savvy movie audience wouldn’t easily guess and yet at the same time, makes perfect sense. The very satisfying ending of this film fulfills both goals. I appreciate the filmmaker’s choice to eschew blood and guts for genuine suspense and chills. I’m not one of those horror geeks who gets off on seeing people’s bodies being destroyed in steadily more sickening and bloody ways. (Apologies if that’s you — don’t mean to alienate half my readers.) However, I think director Catherine Hardwicke went a bit too far in keeping gore out of the picture. When the first couple of corpses are discovered, they are so bloodless and undamaged that it looks like footage from a dress rehearsal. I mean, they’re supposed to have been killed by a wolf — pardon me, a giant, rampaging werewolf — and it was hard to believe they were even in a bar fight! My other minor quibble is that the villagers initially ignore Rev. Solomon’s warning that the werewolf is one of them — and instead hold a big victory party celebrating the slaying of the wolf . This provides the movie-makers with a great opportunity to show a chaotic and unnerving medieval festival, complete with weird masks and Bacchanalian dancing. But come on. First of all, shouldn’t it be OBVIOUS that the human who turns into a wolf lives in the isolated village? And don’t these ignorant peasants respect the opinion of this famed champion werewolf-hunter? In most period movies — and, I believe, actual history too — medieval folk have a low threshold for turning on their neighbors and accusing them of supernatural evil. After writing this review, I checked Rotten Tomatoes and I was surprised that critics gave it a ranking of only 11 percent. Well, I’m sticking to my guns. You’ll have fun watching this movie, as did most audience members, who gave it a ranking six times higher. Curiously enough, a few hours after I saw “Red Riding Hood,” I watched on DVD “The Brothers Grimm,” which also incorporateselements of fairytales. Not as effective a film, with its anything-can-happen approach to the supernatural. But it certainly made for an interesting double bill. Kind of like last weekend when I saw “Con Air” and “The Expendables” back to back — and my testosterone level shot through the roof! "Who, me a wolf?" 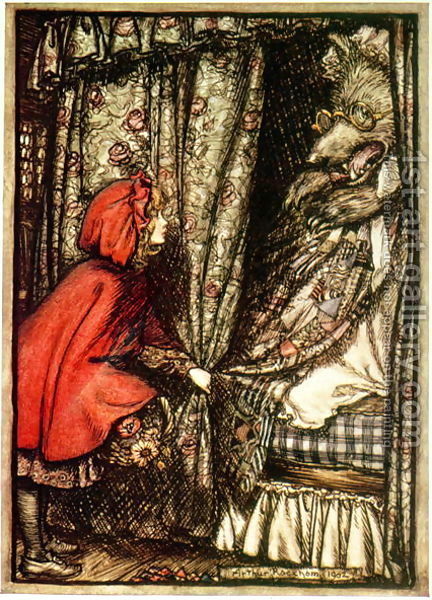 In classic fairytale, Little Red Riding Hood is a bit slow to realize her "grandmother" is not what she seems. Like to be scared? Read C. Michael Forsyth's Hour of the Beast. 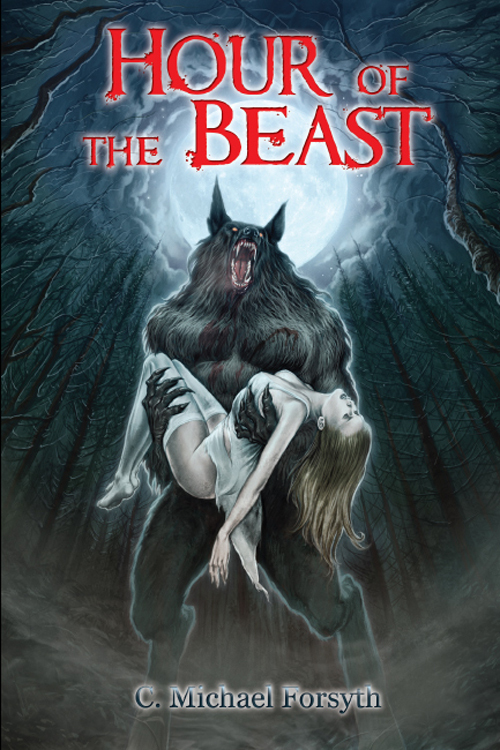 To hear Chapter One of the acclaimed Hour of the Beast FREE click HERE. Sounds right up my neck of the woods. Looking forward to it. Hope there’s a scene where the werewolf dresses up as grandma. Grandma being a werewolf in disguise is definitely the creepiest part of the Red Riding Hood story. Never quite looked forward to visits to my Granny the same way after Mommy read us that fairytale.